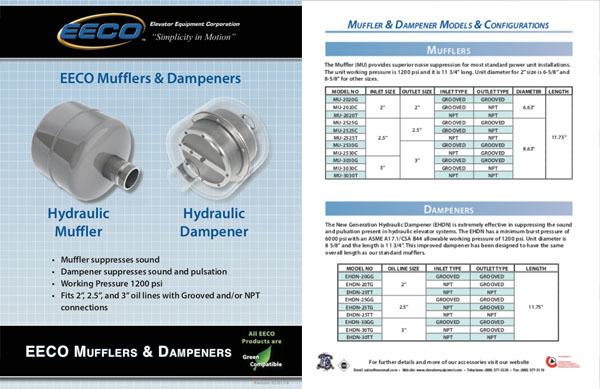 The Muffler (MU) provides superior noise suppression for most standard power unit installations. The unit working pressure is 1200 psi and it is 11 3/4” long. 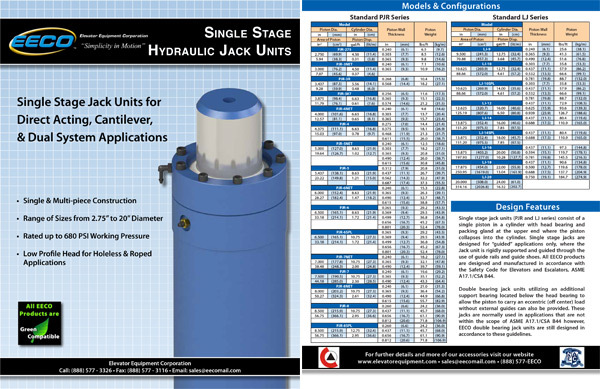 Unit diameter for 2” size is 6-5/8” and 8-5/8” for other sizes. The New Generation Hydraulic Dampener (EHDN) is extremely effective in suppressing the sound and pulsation present in hydraulic elevator systems. The EHDN has a minimum burst pressure of 6000 psi with an ASME A17.1/CSA B44 allowable working pressure of 1200 psi. 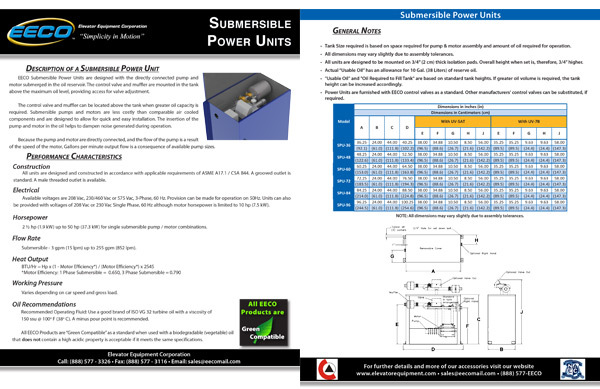 Unit diameter is 8 5/8” and the length is 11 3/4”. This improved dampener has been designed to have the same overall length as our standard mufflers. 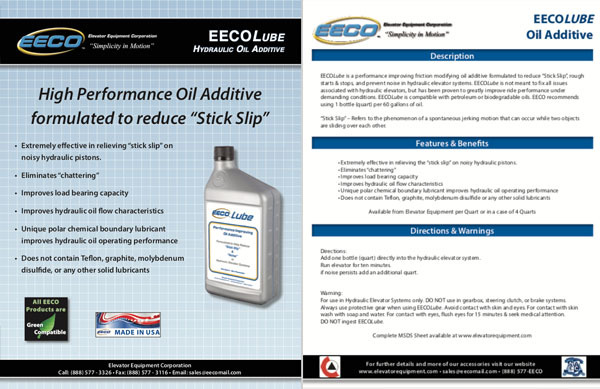 EECOLube is a performance improving friction modifying oil additive formulated to reduce “Stick Slip”, rough starts & stops, and prevent noise in hydraulic elevator systems. • Extremely effective in relieving the “stick slip” on noisy hydraulic pistons. 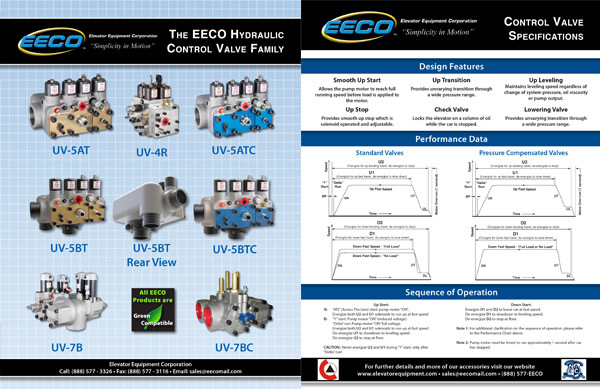 EECO produces Elevator Control Valves that set the standard in the industry for reliability and field servicability. 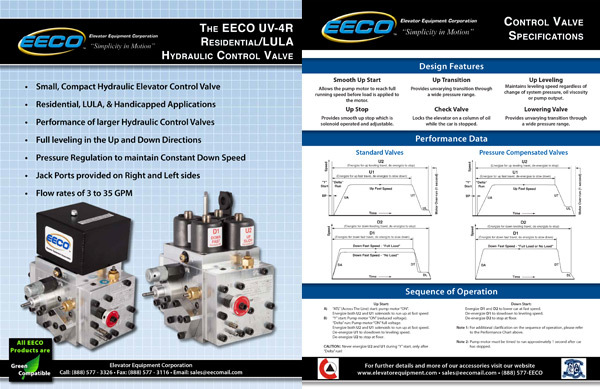 Whatever your elevator project requires, from a residential elevator to the largest freight elevator, EECO has the correct valve for you. The UV-4R Elevator Control Valve is a small, compact valve for Residential, LULA, and handicapped applications. This valve features the performance of larger valves and has full levelling in both the up and down directions. 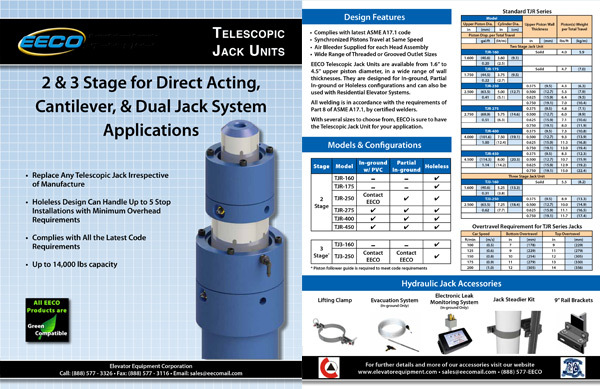 Single Stage Jack Units for Direct Acting, Cantilever, & Dual System Applications. Elevator Equipment Corp. produces three types of Elevator Limit Switch. The LS-1B Limit Switch is designed primarily for use in elevator hoistways as Access, Slow Down, Normal, and Final Limits. The MV-4C Permanent Magnet Switch is designed primarily for applications requiring trouble free service. 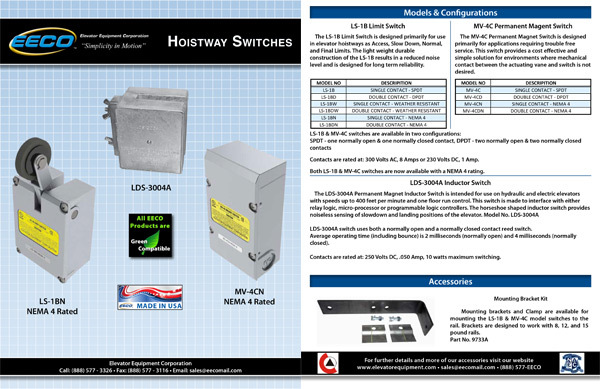 The LDS-3004A Permanent Magnet Inductor Switch is intended for use on hydraulic and electric elevators with speeds up to 400 feet per minute and one oor run control. 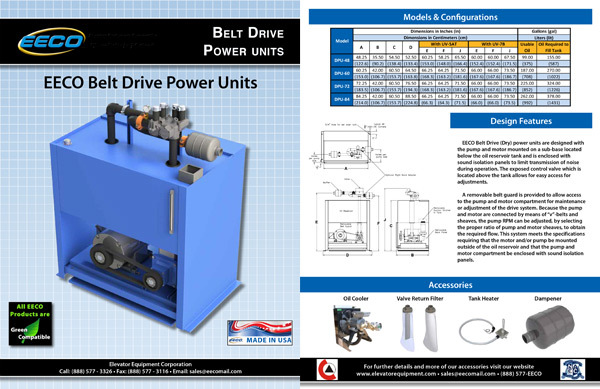 EECO Belt Drive (Dry) power units are designed with the pump and motor mounted on a sub-base located below the oil reservoir tank and is enclosed with sound isolation panels to limit transmission of noise during operation.